Samuel Peaches (Casey Robbins), and Princess Gwen (Marlene Yarosh). 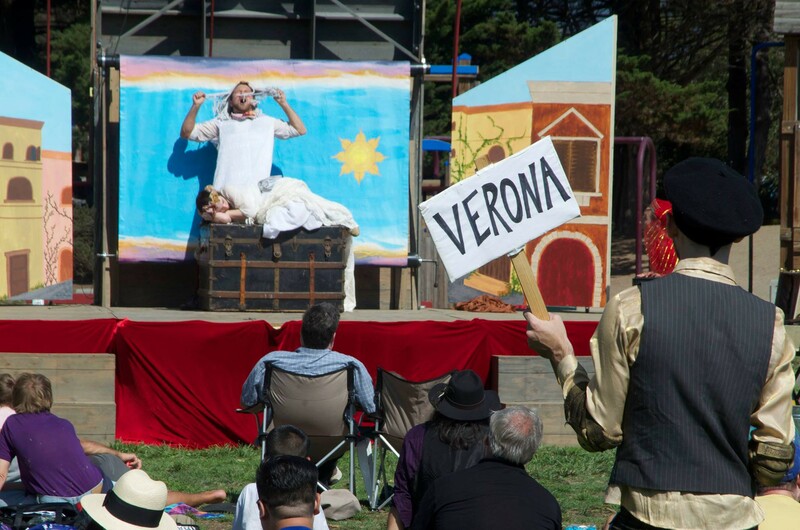 A traveling thespian troupe is coming to a Bay Area park near you. The Peripatetic Players will be mounting its latest, titled Shakespeare or Space Wars, and you have four opportunities to catch it when they visit Berkeley, Oakland, and Alameda this summer. Expect an eccentric mashup of Romeo and Juliet mixed with Obi-Wan and Darth Vader, a.k.a. the Capulets meet Han Solo. One member of the troupe calls it “an homage to two classic star-crossed tales of destiny and daring.” This is a free event for the whole family, but please consider contributing, as there is a high cost involved in traveling around, mounting a set, and performing. The show is general admission, so bring a blanket or lawn chair and watch this group of actors do what they love to do best. Sunday July 16, 1pm, Live Oak Park, 1301 Shattuck Ave, Berkeley, PeripateticPlayers.org.